This time of year, some big city folk like myself are not only pasty, but content with staking out a small stretch of sun-drenched sand and doing little else while on holiday in Mexico. But, no matter how relaxing, laying on the beach in a rum-induced coma is difficult to justify when traveling in the eco-oasis known as the Mayan Riviera. I knew I’d be considerably more active than usual on my trip even before my plane landed in Cancun this January. Flying over the region, you can’t help but marvel at the miles of practically uninhabited dense, green jungle that borders the turquoise Caribbean Sea (and Cancun’s notoriously party-friendly Hotel Zone). Of course, this region of Mexico offers much more than drunken frat dudes, oversized all-inclusive resorts and perfect, powdery white-sand beaches. The expanse of jungle glimpsed from the plane plays host to a variety of exotic flora and fauna indigenous to the Yucatan Peninsula, including saraguato monkeys, crocodiles and endangered jaguars. The area is also home to the Mesoamerican Coral Reef, second only in size to Australia’s Great Barrier Reef, not to mention some awe-inspiring pre-Hispanic ruins. With a dedication to preservation, the Mayan Riviera offers plenty of opportunities to see these and other treasures of the land and sea firsthand, with limited environmental impact. Here are 10 unforgettable eco-friendly adventures that can be experienced in a day’s time. Okay, it may strike you as a tad Disneyland-ish at first glance, but this family friendly eco-park is well worth the entrance fee of USD $70 per person. Occupying about 250 acres, Xcaret truly strives to be an educational and fun experience for visitors from around the world. 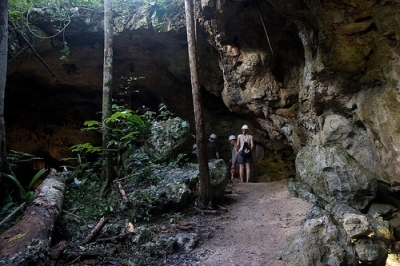 Highlights include an underground river adventure tour (included in the general entrance fee) where swimmers of all ages don bright pink lifejackets and swim (or more accurately, bob along) through an underground river, various caves and ancient cenotes (water-filled sinkholes). Never mind that you stop to pose for photos every so often, one with a costumed employee dressed as an “ancient Mayan native” (photos are for sale at the end of the tour). Other must-sees of this park include a live butterfly pavilion, a giant sea turtle sanctuary, an interactive aquarium and a dolphin center. At night, an entire stadium fills up with visitors to watch music and dance from Mexico’s ancient history through the present day, and includes a fascinating pre-Hispanic ball game, the ancient hockey-like sport played with a flaming ball. 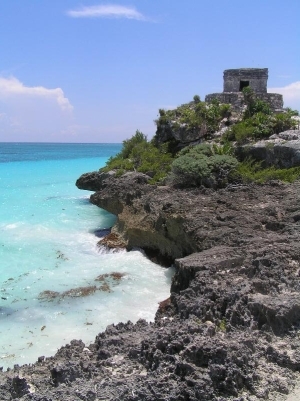 As the name suggests, the Mayan Riviera is home to dozens of fascinating Mayan ruins. The most spectacular, in my opinion, being Tulum. Poised on a steep cliff above the crystal clear waters of the Caribbean, the ruins at Tulum offer visitors a trip back in time. Dozens of tour buses arrive every day to the often overcrowded site, and while a guided tour can be helpful in learning the history of the ruins (albeit loosely interpreted: our guide informed us that Tulum was named for foul-smelling Spanish explorers when, in actuality, it means “fence” or “wall”), you may find yourself wanting to wander away from the pack to take photos and explore on your own. 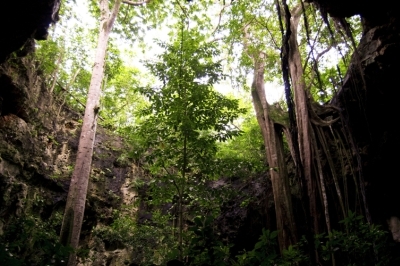 Most structures at Tulum are off-limits to ensure the site’s preservation. Several groups of independent-minded travelers were observed riding bikes into the park, where the entrance fee must be paid by all visitors. Make sure to pack sandals and a towel — the spectacular beach below the ruins (located down a semi-treacherous wooden staircase) is a must-visit. It’s easy to see why this nature preserve is named for the Mayan term for “gift from the sky” or “gift from Heaven.” With over 2,500 square miles of beautifully scenic grounds, including unexcavated ruins, mangroves, freshwater river ways, wetlands and lagoons, Sian Ka’an truly lives up to its name, and was decreed a UNESCO World Heritage Site in 1987. Visitors can participate in a number of low-impact activities interesting to tourists, including conservation projects, fly fishing, kayaking and land tours. The revenue generated here is used to fund various educational and conservation programs at the park, which is operated using ecologically responsible technologies, including solar and wind power, rainwater collection and systems for wetland waste management. This archaeological site is one of the most famous groupings of ruins in Mexico, as well as the most visited. Of the many structures here, the most easily recognizable is Kukulcan’s Pyramid, a square based, stepped pyramid approximately 79 feet tall, believed to be used for astronomical purposes (evidenced by 365 steps). You may find yourself wanting to scale the pyramid, but as one tourist allegedly died here, climbing is now off limits. Tours of the site are readily available though, like at Tulum, wandering on your own can give you a uniquely personal sense of the grandeur of this ancient city. Even during the height of tourist season, the site is so large (nearly five square miles) that it somehow manages to feel empty. It’s hard to imagine how such sites may have looked hundreds of years ago when the plazas were filled to capacity with celebrants for important mass rituals, as historians believe. A light and sound show dramatizes the history of the site most evenings at 7 p.m. The underwater cave systems unique to the Yucatan Peninsula are one of coolest things to explore in the Mayan Riviera. Hidden Worlds Cenote Park offers very accessible diving and snorkeling to visitors of all ages and experience levels, and its beautiful caves were featured in a number of films, including the renowned BBC series, Planet Earth. Group dives are limited to four people at a time, so exploring the caverns inside the park is an intimate, educational experience. For those who prefer to stay above ground, you can try the one-of-a-kind sky cycle, where visitors can pedal over the jungle canopy on a suspended bicycle at tree level. 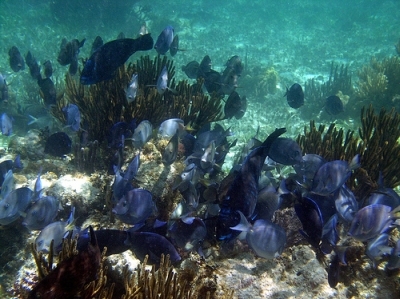 Global conservation efforts like the Mesoamerican Reef Tourism Initiative have aimed to protect the reef by limiting tourist snorkeling and scuba diving to certain designated areas, and mandating that visitors wear biodegradable sunscreens and lifejackets to further reduce impact on the sensitive ecosystem. Although it is also possible to scuba dive and snorkel in Cozumel (the island just off the coast from Playa del Carmen), this national park is relatively undiscovered by the hoards of tourists who come to snorkel in the Mayan Riviera. The fee to enter the park is a mere USD $2.00, and tours are easy to find once inside. Xel-Ha Park may remind you of Sea World in some ways, but with its unique ecosystem created by a subterranean mix of freshwater and seawater, most visitors will truly find much to explore here. Featuring crystal clear waters and hundreds of tropical fish, Xel Ha is a great place to try snorkeling for the first time. Among the many activities available, the park is well known for its program for swimming with dolphins, especially popular with kids, and of course, the young at heart. Located about an hour away from Cancun by boat, this island is just 8.5 km (5.28 miles) long, but is thought to be a significant site for sea bird nesting in the Mexican Caribbean. The Mexican government named it a National Park in 1988 and it serves as a protected area, though tourists interested in birds and the giant sea turtles that nest here can join in on one of a few limited tours that take place on the island each day. A small museum also assists visitors in learning about the wildlife on the island. Though the name refers to lizards, flamingo fans will find something to love at this bird sanctuary. Playing host to Mexico’s largest flamingo population, this protected area features sand dunes, canals and mangroves that serve as nesting places for over 8,000 of the long-legged pink birds. Protected by SEMARNAP to preserve the diverse flora and fauna of the area, it was registered by the United Nations in 1986 as an important area of international wetlands. There are no hotels here, but the nearby village of San Felipe offers some rustic accommodations. Most visitors arrive by tour bus or rental car early in the morning, and many employ local tour guides at negotiable rates. Located about a 100 km (62 miles) away from Cancun, this park features almost 1,000 miles of unexplored rainforest and cenotes. The main cave on this land is enhanced with light fixtures so that it can be easily toured by amateur explorers. Inside, visitors will discover thousands of fascinating stalactites, stalagmites and natural sculptures formed by water and calcium carbonate over millions of years. The knowledgeable tour guides will also be happy to point out some of the local wildlife, including spider monkeys, wild boars, indigenous birds, iguanas and white tailed deer. Prices start at about USD $24 per person. Fine, so it doesn’t qualify as a nature preserve. But this formerly sleepy fishing village is a wonderful little town full of restaurants, overpriced tourist shops, bars and outlets where visitors can find experienced guides for snorkeling, scuba diving, parasailing or whatever else you might desire to do. Little hotels and hostels, like the charming “Ghost Hotel” line the streets, and serve as an affordable option for young adventurers. Just beware, a cuba libre here costs double what it should. If you are looking to save pesos, ask for prices up front.